Mesmerizing in its pristine glory. totally awesome!! hydrangeas are so beautiful in every season and you edited them beautifully! 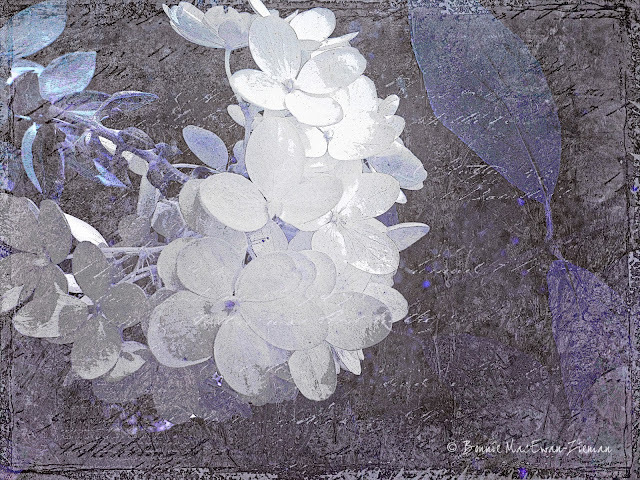 This is such a beautiful hydrangea - it looks gorgeous in your editing. That is a lovely image - very delicate looking. Bonnie, this is absolutely gorgeous! One of my very favorite flowers, and the work you have done on this one is magnificent. Wow - I love this! The more I look, the more I see and it's so eye-catching. Love the unusual treatment of a flower shot. Happy Holidays. A nice... no ... a beautiful picture and fine work. Wow, I'm so drawn to this Bonnie, beautiful! Beautiful composition, I love those gorgeous colors and textures. Bonnie....This is a luscious image of the hydrangea. It's also in my favorite colors! just love this bonnie! You are so creative! So beautiful and delicate! What a gorgeous effect you achieved. Wonderful flower and great textur. This is just wonderfully done and inspired! So delicate and lovely! My compliments!